You may notice over time that the bright shade of your teeth has begun to fade. This is often due to staining in your dental enamel. The enamel is an important part of your tooth, as it protects the sensitive inner pulp of your tooth. Wear in your enamel is usually the result of bacteria, and it leads to cavities. So, is the staining you notice on your teeth a product of bacteria? Probably not. If you see a dark spot on your tooth, this may be a cavity forming. However, the general yellowing or staining of teeth isn’t necessarily an oral health issue. Staining of the enamel happens over time. If the shade of your teeth has yellowed or faded, this is almost certainly extrinsic staining — staining of the enamel caused by chromogens. The food you eat, the drinks you drink, and lifestyle habits like tobacco use can all cause pigmentation to become trapped inside the porous surface of your dental enamel. This causes your teeth to lose their pristine, white color. Almost everyone will experience some degree of extrinsic enamel staining throughout their lives. 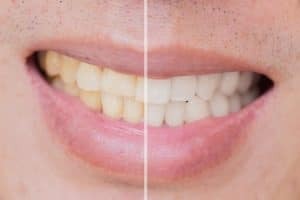 If you want to get rid of the staining and restore the color of your teeth, teeth whitening is a good option. Most forms of teeth whitening use a bleaching agent to remove pigment from the enamel of your teeth. You may have already tried teeth whitening. If you used drugstore products, you may have experienced limited results. Teeth whitening treatment provided by your dentist typically offers much more significant results. Your dentist can even give you a take-home whitening kit so that you can whiten your teeth on your own schedule. Easy-to-use trays only need to be worn for a few hours at a time. In just a couple weeks, you’re likely to see significant whitening results. Not every tooth stain is the product of lifestyle habits. Some staining — intrinsic staining — can be the product of a medical condition. The stain caused by bacteria is likely a cavity, and needs to be treated right away to prevent additional damage to your enamel. Teeth whitening will not get rid of your cavities. That’s why it’s best to consult with your dentist. Your dentist can determine the source of the staining and administer the proper care to keep your teeth healthy and looking their best. Dr. Michael Flynn offers comprehensive care for patients. Whether your teeth need restorative dental care, or you’d like to improve the color of your teeth, Dr. Flynn has a treatment that can help. Learn about your at-home teeth whitening options by contacting Michael Flynn Dentistry in West Allis, WI at 414-541-8250.